I always thought Laidak was just a made up name. But apparently, it is another word for “Taugenichts” in German. According to my dictionary, this translates into scapegrace, scallywag or good-for-nothing. A Laidak, therefore, is a person who lazily wanders through the world, not bringing any benefit to society. On the one hand, Laidak is the perfect place to do just that. 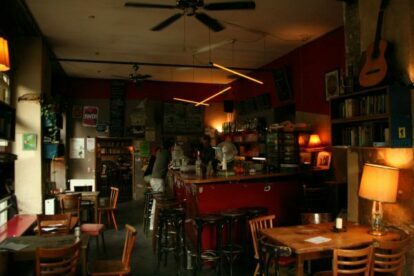 Drinks here are on the cheap, the shabby furniture is very suitable to spend long hours with a beer or two, or three… There are cards and board games to (somewhat uselessly) pass your time. Some of them are complete and usable, some of them not so much. Just please don’t try the “Smellory”, I think it’s already a bit old and the tokens smell awful. And while we’re talking about smells: Laidak does allow smoking. On the other hand though, you will find many books on their walls as well. You will see people leafing through novels and pamphlets until closing time; groups discussing current and old problems of our society. Laidak also organizes political and cultural events. So, should we perhaps interpret the name of the bar in terms of 19th and 20th century literature where a “Taugenichts” was one who did not conform to the bourgeois ideals of their families and devoted themselves to supposedly useless lifestyle as artist or philosopher? Decide for yourself.